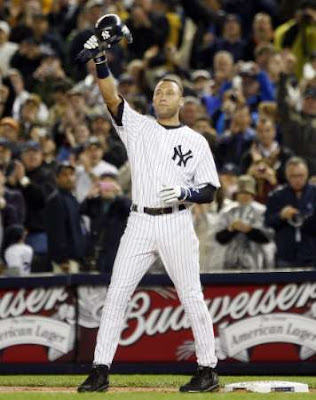 On Friday night Derek Jeter broke the all time New York Yankees hits record, previously held by Lou Gehrig for 72 years. A third inning single to right field gave Jeter the record of 2,722 hits, breaking the record of the man whose career was cut short by illness in 1939. Jeter set the Yankees hit record in his 2,120th Major League game. Gehrig played in 2,164 Major League games. The phenomenal Yankees shortstop has more hits in fewer games than the man who many consider the greatest Yankee product ever. Derek Jeter's team milestone is the biggest story in Major League Baseball this year. Other big stories like the Manny Ramirez drug suspension, an unassisted triple play to end a game, Mark Buehrle's perfect game...none of those match up to the historic impact that Jeter's hit record displays. The captain of the Yankees is now more than a leader for the Yankees of the past decade or so. He's the man among the men...a king of kings. Some of PhoulBallz.com's favorite people chimed in on Jeter's accomplishment this weekend. Here is what they had to say. Tyrone A. Johnson of Millennium radio: I think it's amazing. To have the most hits for the most famous franchise in sports is huge. Also, to play this well at age 35 shows the hard work he has put in throughout his career. Former Phillies beat reporter Mike Olshin: I'll say this -- you cannot think of the modern era Yankees without thinking first of Derek Jeter. And for the only team to win four titles in five years during the Free Agent Era, that says an awful lot. The Shore Sports Report's Joe Giglio: It's a tremendous achievement in Yankee history, and yet another ring up the ladder of greatness for the career of Derek Jeter. Love him or hate him...Derek Jeter is an all-time player. His whole career has been about everything but numbers: professionalism, winning, leadership, being a role model. When a player who isn't defined by numbers starts to accumulate immortal stats, it deserves to be talked about. Baseball fans, not only does Derek Jeter deserve to be talked about now, but Derek Jeter deserves to be talked about for generations. The list of Yankees legends is quite long, but Derek Jeter officially lengthened that list by one name on Friday night. Go see a Yankees game and tell your grand children that you saw Derek Jeter play.